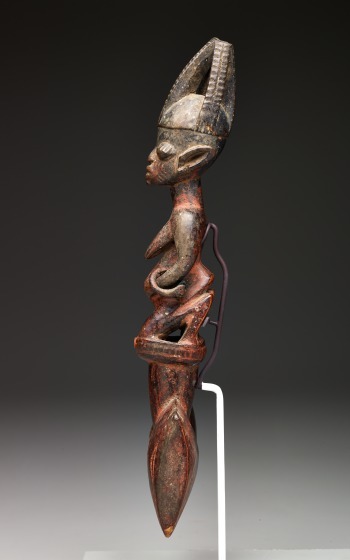 Among the objects used to honor the Yoruba god of thunder, Shango, is the oshe Shango, or dance wand. It is carried by Shango priests and devotees during public worship activities and enshrined on the deity's altar. 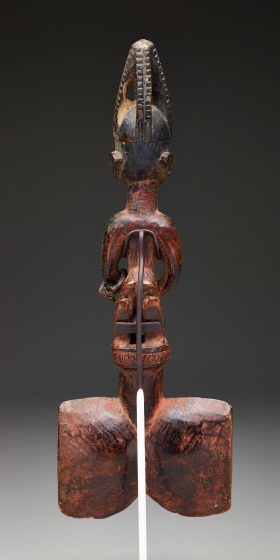 The basic form of the oshe Shango is a shaft with a double club or axe projecting underneath or from the head of the sole or central figure in the composition. The axe blades are shaped like thunderstones or Neolithic celts, which Shango's devoteees believe are thunderbolts Shango hurls toward those that offend or displease him. 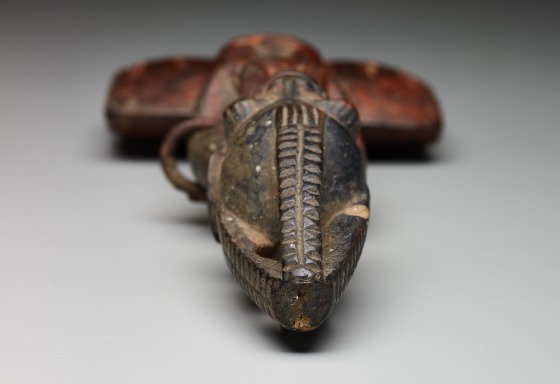 This ritual object was originally carved from the àyàn tree on which Shango committed suicide. Oshe Shango range from nonfigurative sculptures with shafts ending in undecorated double axes to complex figurative configurations with unique interpretations of the double axe. The stylistic diversity found in the designs of oshe Shango can be attributed to the wide dispersion of Shango worship, unlimited iconography (the only restriction is that the deity may not be portrayed), and the creative prerogative of the artist or patron. Oshe Shango project Shango's kinder, gentler side: he makes barren women fertile and serves as the "patron saint" of twins. 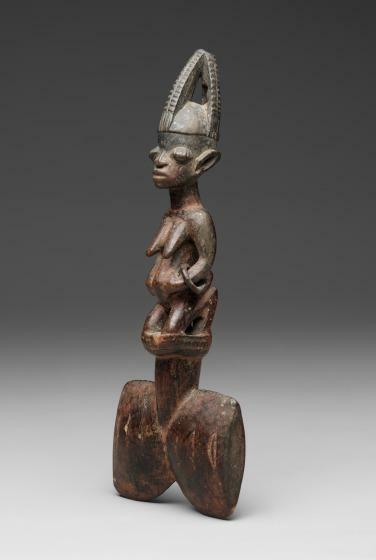 The female figure depicted on most oshe Shango is a devotee or priestess whose head supports the double axe. 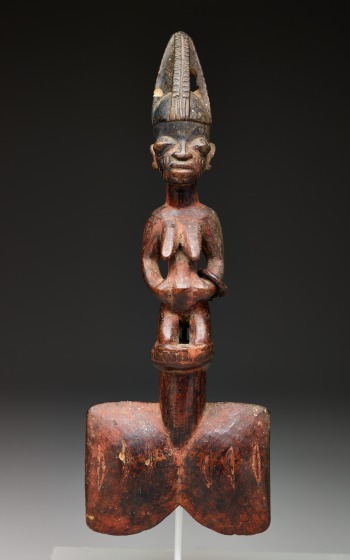 The priestesses or female supplicants represent Shango's benevolence as he bestows the blessing of children upon his faithful worshippers and protects children(ibeji). 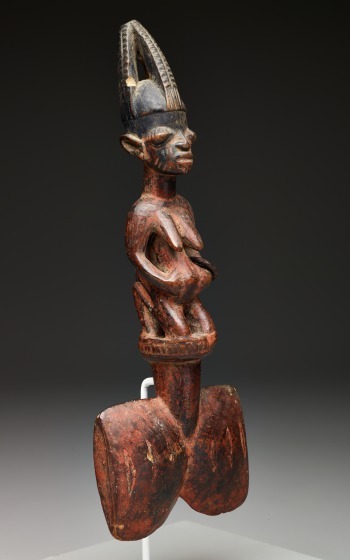 The supplicant depicted on this oshe Shango is pregnant. Posed in a conventional kneeling position, she holds her protruding abdomen with both hands. Her openwork hairstyle with four braids meeting at the top recalls the shape of the ile ori or "house of the head." She is further adorned with vertical scarification marks on her cheeks and jaws and a labret in her lower lip. 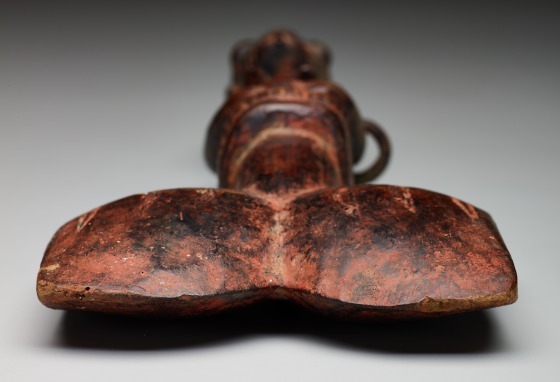 While the figure's pose is conventional, the placement of the double axe at the bottom of the shaft is rare. 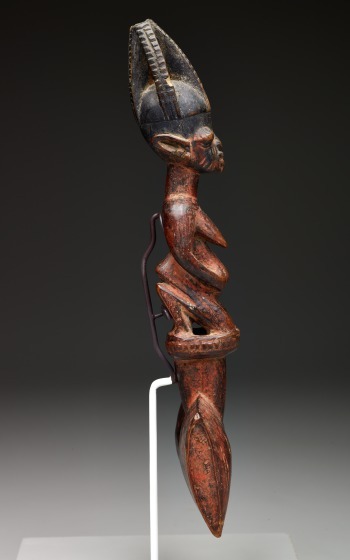 In contrast to conventional oshe Shango that are held at the shaft, the head of this wand serves as the handle, resulting in the flattened facial features and smooth surface. 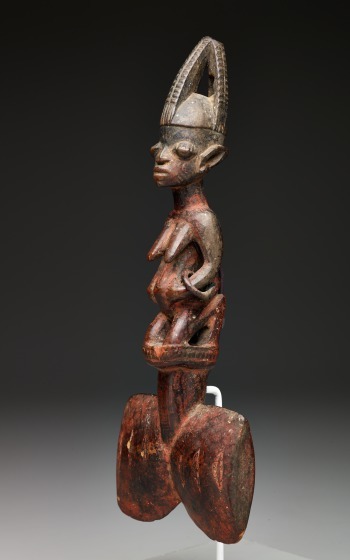 This rare example is attributed to the Master of the Owu Shrine, an artist named after an unusual oshe Shango that had been documented in situ in the Igbomina town of Owu. Several objects, including twin figures and bowl carriers, share similar or identical traits with the Dallas oshe Shango. They include: an elongated head with a swollen cranium that joins a conical shape extending below the eyes, a head set at an angle on the neck, prominent elongated ears that extend the jawline, rounded elongated shoulders that flow into bent arms cut away from the torso, hands that have splayed fingers, buttocks that are flattened underneath and jut out sharply above the soles of the feet, and the lower body conceived as a triangle that is cut deeply to separate the thighs from the legs. The Master of the Owu Shrine possibly lived from about 1950 to about 1925. Roslyn A. Walker, The Arts of Africa at the Dallas Museum of Art (New Haven and London: Yale University Press, 2009), 110-111.